Go Long: How Far, How Fast, & How to Fuel. Long run density and fueling will have you feeling strong to the end. The long run is the most basic and important element of marathon training. However, as you progress as a runner the details shift to maintain it's effectiveness and impact on performance. Much more can be written about long runs than we are going to tackle in this post. I am going to focus on the crucial questions of how far, how fast, and how to fuel your long runs. How far? The initial purpose of the long run is to extend the duration you can run (duh!). This has nothing to do with speed. It is pure endurance, the ability to go right, left, right left, many times. 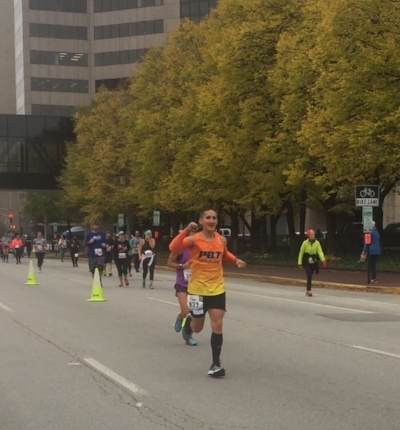 When you decide to take on the marathon, you need enough endurance to be able to continue to run for 26.2 miles. Thankfully, the best principle in exercise physiology is on your side for this one. Your body not only adapts to training, it overcompensates to training. You know this because you have run longer and/or faster than ever before on several occasions. Every time you have either run your longest distance or set a PR you prove this principle. The obvious benefit for the long run is that you do not need to run 26.2 miles to run 26.2 miles on marathon day. Remember, this has nothing to do with speed, simply finishing. It seems in rough terms, endurance has about a 25% overcompensation effect. So if you can get to the 20 mile neighborhood, you should be able to finish. I used to have more interest in the discussion about the ideal longest run for a marathon. While I still think 20-22 is a good answer to that question (20 is fine for your body, but 22 is better for your head), I am now much more interested in the density of long runs. I know averaging a runner's 5 longest runs leading up to race day is a better predictor of a good marathon than their longest run. How fast? My quick answer to this question is slow enough to make it the entire distance. Here is where the shift kicks in for your long runs. If the objective is to finish and live to tell the story, jogging long runs is fine. The moment you start thinking if you can break 4 hours, or qualify for Boston, or win the thing, jogging your long runs will no longer do. Your most limiting factor on race day is how much muscular tension you can maintain for 26.2 miles. Jogging, at least for those beyond the beginner stage, will not produce enough muscular tension to be able to maintain a faster pace to the finish. You either have to run longer and longer or faster. As with anything in training, this can be overdone. The guideline I give my runners once they are able to cover a distance without concern, is to run it faster as long as they can maintain it without a crash and they are able to recover in time for the next quality workout. How to fuel? I like thinking about marathon fueling as an IV of sugar, salt, and water. If you can keep these levels relatively constant and prevent any of them from dropping beyond a critical point, marathon running is a much easier game. We expect you will be low on all 3 of these at the finish, it is your challenge to keep the levels as high as possible. Most people can store about 20 miles of fuel. Thus the whole "wall" concept. If you can take in another 500-600 calories during the run, you've added enough to get to the finish without crashing and slowing enough to live the cautionary tale. Pick you favorite method of getting in this amount of carbohydrate, but gels are hard to beat for efficiency. Sweat rates and therefore fluid intake rates will vary with individuals and conditions. Practice drinking with a beginning target of 6 ounces per 20:00 of running. With practice you will be able to take in even more. A little, more often, is tolerated much better than 18 ounces at once every hour. Think IV drip! When conditions are such that you cannot absorb enough fluid it is time to add sodium to the mix to aid in absorption. There is no substitute for practice and paying attention to conditions, intake, and how you feel. With the time remaining before marathon day continue to bank long runs at a distance and effort that challenge you, but allow you to stay healthy and enthusiastic about running. Additionally, practice and train you body for your race day IV drip. The combination will have you ready to be at your best when it matters most.